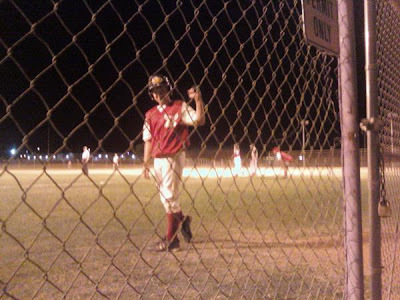 I gave up watching "24" for a Monday evening to watch junior high baseball. Both of the junior high guys I knew on the team rocked--that's you, Craig and Kyle--and I'm currently digging the warm Arizona nights. 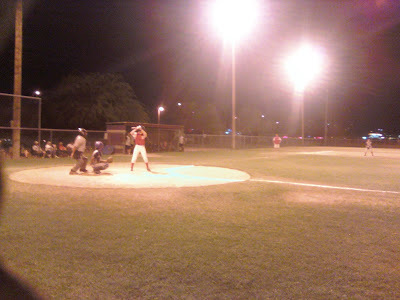 But Fremont Junior High needs to invest in some new lighting for their baseball field. Everything appears a hazy yellow. Made my eyes hurt. Watching and cheering for junior highers during their games, concerts, or other activities is one of my favorite parts of ministry. I got to have a great conversation with Kyle's and Craig's parents and cheered on two students. Two families were encouraged, and I had a fun night watching baseball. Ministry shouldn't only happen within the church's building on a Sunday morning or Wednesday night. It's not limited to a Bible study or a worship service. Ministry happens everywhere because every moment is a spiritual moment. Watching junior high baseball is spiritual. Chatting about life and family is spiritual. Cheering the guys on is spiritual. Being present with people is spiritual. Sitting next to a hazy yellow field watching junior highers swing at baseballs on a warm spring night can be a beautiful act of worship.